The Boeing X-32 was a multi-purpose jet fighter in the Joint Strike Fighter contest. It lost to the Lockheed Martin X-35 demonstrator which was further developed into the F-35 Lightning II. In 1993, the Defense Advanced Research Projects Agency (DARPA) launched the Common Affordable Lightweight Fighter project (CALF). The project's purpose was to develop a stealth-enabled design to replace all of US DoD lighter weight fighter and attack aircraft, including the F-16 Fighting Falcon, F/A-18 Hornet, and vertical/short takeoff / vertical landing (V/STOL) AV-8B Harrier II. Around the same time the Joint Advanced Strike Technology (JAST) project was started. In 1994, the US Congress ordered the two to be merged into the Joint Strike Fighter Program. Many companies took part in the first phase of this project, which involved drafting concept aircraft designs for submission to the Department of Defense. However on 16 November 1996, only Boeing and Lockheed Martin were awarded contracts, allowing them to produce two of their concept aircraft each. Under the contract, these fighters were required to demonstrate Conventional Take Off and Landing (CTOL), carrier take off and landing (CV version), and short take off and vertical landing (STOVL). They were also expected to include ground demonstrations of a production representative aircraft's systems, such as the Preferred Weapon System Concept (PWSC). On 26 October 2001, the Department of Defense announced that the Lockheed Martin X-35 won the JSF competition. Boeing views its investment in the X-32 as a strategic investment, yielding important technologies which it has been able to adopt in the F/A-18E/F Super Hornet and other studies. In 2005 the Boeing X-32A was transferred to the National Museum of the United States Air Force in Dayton, Ohio. Its condition had deteriorated due to sitting outside for several years following the end of the JSF competition. The X-32B was transferred to the Naval Air Station Patuxent River's Naval Air Museum in St. Mary's County, Maryland in 2005, As of June 2009, it is undergoing restoration at the museum's restoration facility. Scott has done a really nice preview of this kit so all I would be doing is repeating what he has already said. I started with the cockpit painting it light grey and the instrument consoles and main panel semi-flat black. I used light grey and white to pick out the details and gave the tub a slight wash with diluted ink. Now I moved on to the air intake, the part of this plane that stands out the most. Seeing that the seams would not show all that much I went on ahead and painted the upper and lower parts gloss white. Also during this phase I painted the internal weapons bay and the wheel wells. I glued in the cockpit, air intake and weapons bay and added some nose weight before joining the lower and upper parts of the fuselage. There is a back plate and side walls for the engine outlet that need to be glued into place before the fuselage goes together and I found that this area could be painted in the later stages of the build. 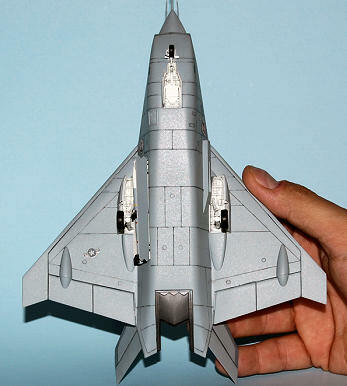 Being that the two halves of the fuselage include the wings this eliminates the part of aligning the wings and give you less area of a seam to sand out. There is an air intake to add to the left side under the wing along with the nose pitot tubs used on the test version of the aircraft. With this completed the main components of the model are ready for masking and paint. Clean up of the landing gear and the bay doors your ready to move on. I opted for the overall Light Ghost Grey scheme FS36375. I used Tamiya masking tape to mask off the area inside the air intake and craft foam to mask off the areas of the landing gear wells and weapons bay. I also masked off the unpainted areas of the jets exhaust so I would have a smooth area to paint the NMF later. 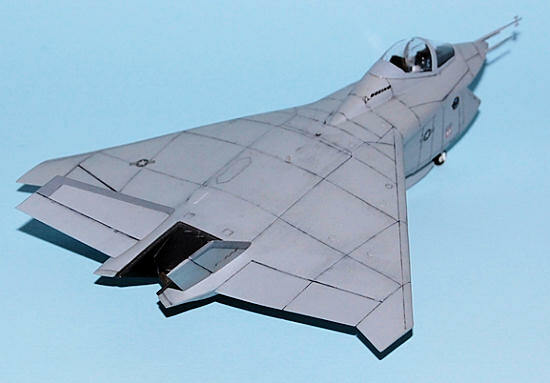 I airbrushed the Light Ghost Grey to the body and the gear bay doors along with the two vertical stabilizers. I painted the leading edges of the vertical stabilizers Dark Ghost Grey. Once dry I applied Testors Gloss from the can. The decals went on with no problems and no need for any setting solutions. I used thinned artist ink for the panel lines. Here I discovered that I had not gone back and re-scribed some of the lines on the side of the fuselage. Sometimes you just forget the basics. When the ink wash dried I sprayed on Testors Dull Coat to seal in the decals. Now I removed the masking for finial assembly. At this point an ink was also washed into the wheel wells and weapons bay and on the landing gear struts. For the exhaust area I painted Testors Model Masters steel and exhaust and dry brushed white to give it a used look. I attached the twin vertical stabilizers, landing gear and gear doors all with no problems. The weapons bay proved to be more challenging. A rather awkward area to work at once the landing gear was in place. So I might have gotten these steps out of order. I opted to go with the JDAM on the retracted launcher and the AAMRAM on the extended launcher. Then I tried to add the weapons bay doors. I should have done all of this before the landing gear was attached. I will know next time. But I did get everything to attach where it was supposed to and moved on to the cockpit. Some touch up painting with the flat black and on went the HUD display and in went the seat. I decided to use the kit provided seat sense I was going to display this with the canopy down. So it just did a detailed paint job to the seat and in it went. Not a simple kit but a novice can handle it. I like the subject matter and the simplistic paint scheme makes it a fun build. A nice addition to my 1:72 line up.